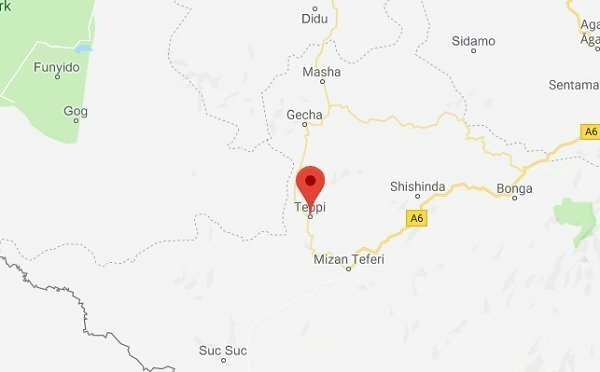 Renewed violence in Tepi town, in the Sheka Zone of the Southern Nations, Nationalities, and People’s Region, left 10 people dead, residents of the town told Amharic service of the Voice of America. The town’s Justice and Security Administration say, however, the number of people killed in the violence today is only five and unspecified numbers of civilians are wounded. The town is reportedly tense even after the violence. The violence is said to have something with identity question and demand for autonomy. Failure on the part of government to take measure to enforce rule of law in connection violence in the town in the past is believed to have encouraged the latest round of violence. Southern Nations, Nationalities, and People’s Regional State is facing numerous demands for statehood which means language groups vying for self rule with direct relation with the central government. The region is composed of more than 50 language speaking groups. The number of some language groups within this region is weigh more than the number of some language groups in the country that are running a regional state of their own. For example, Benishangul Gumuz regional state does not even have a million populations where as some language speaking groups in Southern Nations, Nationalities, and People’s Regional State constitute more than two or three million people. Sentiments of ethno-nationalism, even in its moderate form, seem to be behind the push for the question of statehood in the region. Instability fueled by ethnic politics has become pervasive in the country –especially under the leadership of Prime Minister Abiy Ahmed. As much as ethnic politics is a problem on its own, there are beliefs that violence in some parts of the country is instigated by TPLF leaders who lost power in the central government about a year ago. Yet, political pundits in the country squarely blame ethnic politics for incessant ethnic violence in different parts of Ethiopia. Prime Minister Abiy Ahmed’s administration managed to get House of People’s Representatives’ approval to establish Identity and Boundary Commission which is tasked to study boundary and identity questions in different parts of the country and recommend possible solutions to the House of Federation which deals with relations between ethnic based states in the country. Tigray region, which is facing identity questions over Wolkait and Raya regions which were incorporated into the region after 1991, rejected the federal government’s decision to establish the commission and does not want the newly established commission to involve in Tigray over any identity question/s. Many still seem to question if Ethiopia could be stable and unified before making transitions to a kind of politics that focuses on citizenship as opposed to ethnic identity – a task that might require a fundamental structural adjustment for the existing ones are designed for ethnic politics.